This falls is so named because you can (presumably) walk behind them and stay dry. Although you won't be directly in the stream, you'll get sprayed with mist and dripped on, so the name is not entirely accurate. But it's sure nice on a hot day! The Cullasaja River is fairly large here as it rushes overhead. The free-fall culminates in a narrow chute into a water-filled chasm. 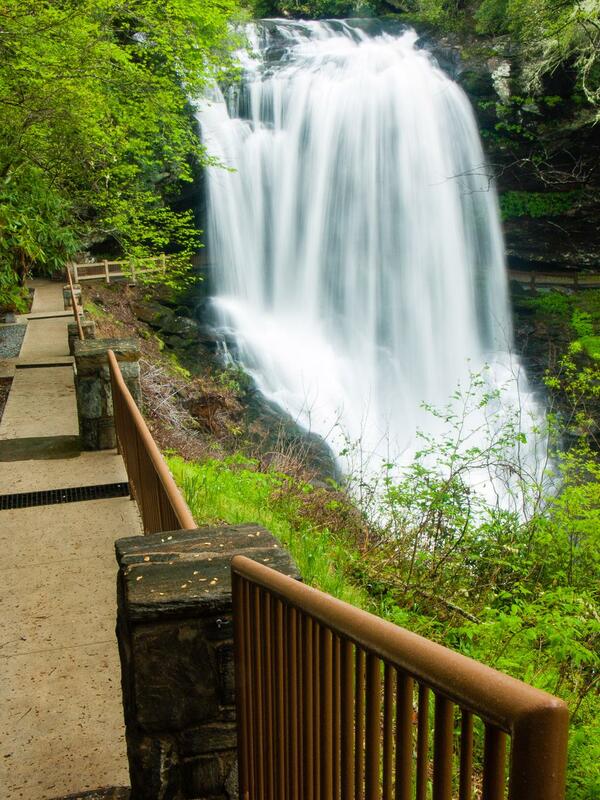 Visit after a good rain for an especially impressive view of the wall of falling water. From downtown Highlands, NC, travel about 3.5 miles West on US Hwy. 64 into the Cullasaja River Gorge (a little less than a mile past Bridal Veil Falls). The fancy new parking area is signed, on the left, with room for about 25 vehicles. An impressive, fully accessible, bridge-like overlook structure now allows anyone a good view of the falls from above on a nearly level grade. It's to the right as you come out of the parking area. To the left, a a newly renovated concrete walkway winds down a few sets of steps, past some neat rock outcrops, and then behind the falls. The path changes to gravel as it goes behind the falls and ends in an overlook area on the other side. This is great for kids - sturdy fences and railings along the whole way ensure little ones can't get to any unsafe areas.